OTTAWA – A local Tory volunteer has admitted to posting an image likening provincial cops to Nazis and Liberal leader Kathleen Wynne to Adolf Hitler. A screenshot Facebook picture, obtained by the Sun, was uploaded June 3 under an account for Robert Stocki, a former Ottawa police officer who is currently listed on the board of directors for the Ottawa West-Nepean PC Association. 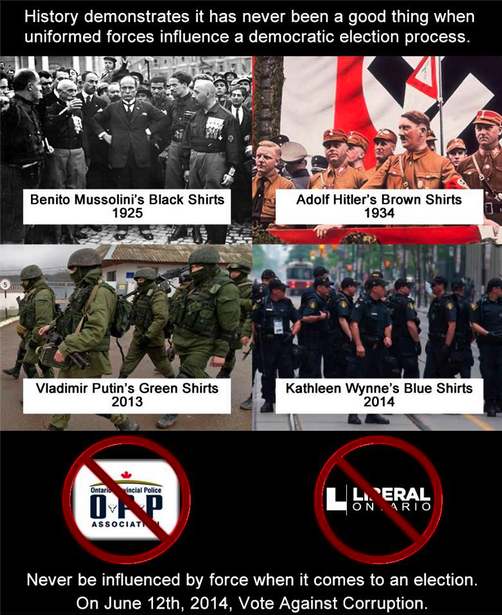 It depicts known dictators and their troops: Benito Mussolini’s black shirts, Hitler’s brown shirts, Vladimir Putin’s green shirts, along with Kathleen Wynne’s “blue shirts” — OPP officers. Wynne’s face is not used. “History demonstrates it has never been a good thing when uniformed forces influence a democratic election process,” reads the caption posted on Stocki’s account. The comparison was made the day after the Ontario Provincial Police Association, led by Jim Christie, released two controversial attack ads against PC leader Tim Hudak for his stance on arbitration, public sector pensions and wage freezes. He e-mailed it to the Sun as “one of the many” images circulating on Facebook regarding the OPPA’s position, but later recanted. “I completely stand up for what I’m saying,” said Stocki, adding his Facebook account hasn’t been hacked. While four people ‘liked’ the post, others denounced it. “There is partisan politics, and then there is sheer stupidity,” wrote a man who identified himself as a city cop, calling it “shameful” to lump OPP with those “responsible for the execution and deaths of millions” of people. “No, you’re right, the OPP is not involved in executions,” was the reply under Stocki’s name. Stocki spent 13 years as a sergeant and traffic cop with OPS and now works as a paralegal. He has a website, trafficticket.tv, helping motorists beat charges. Stocki confirmed he’s volunteering for PC candidate Randall Denley’s campaign. Denley, a former Ottawa Citizen columnist, is running against Liberal incumbent Bob Chiarelli. “The comments are sickening and should be immediately repudiated and condemned by both Randall Denley and Tim Hudak,” Chiarelli said Thursday. Christie was unavailable for comment Thursday. Denley and Wynne could not immediately be reached.